Currently streaming on the horror streaming service Shudder, which has a free trial you can sign up for. This viewing is part of Strange Club; join us for more out-there stuff. 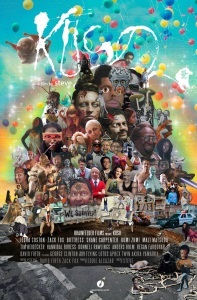 LA Weekly says: So thoroughly conceived that it demands appreciation if not quite love, Kuso offers gross-out Afro-future horror for the dank-memes generation. Shudder isn't available in my country, but I am going to try and watch it after reading that. I'm glad this was called out in this particular way. My viewing very much left me with the impression that this is a film with a lot of complex things to say (or question) about black identity (I'm still sussing out what precisely those things are). I think it's a riveting and well-made film, and maybe even as important, in its own way, as Get Out is for African-American filmmaking in 2017; I definitely need to watch again.